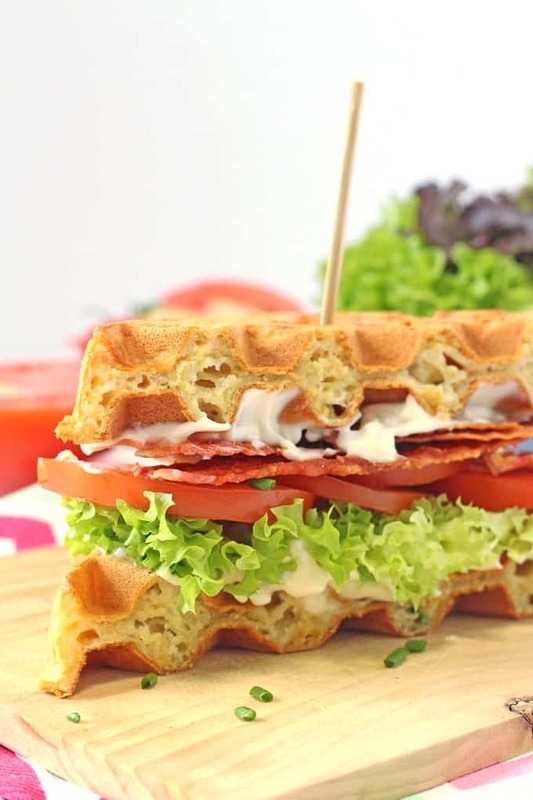 A delicious BLT sandwich made with savoury cheddar and chives waffles! I think it’s a very sad stage of affairs that I have reached the grand old age of 33 (34 next week but lets not mention that again!) without ever eating a savoury waffle. Lucky for me I was able to put this right recently when Sage sent me one of their Heston Blumenthal Smart Waffle Irons to try out and boy oh boy was it worth the wait! 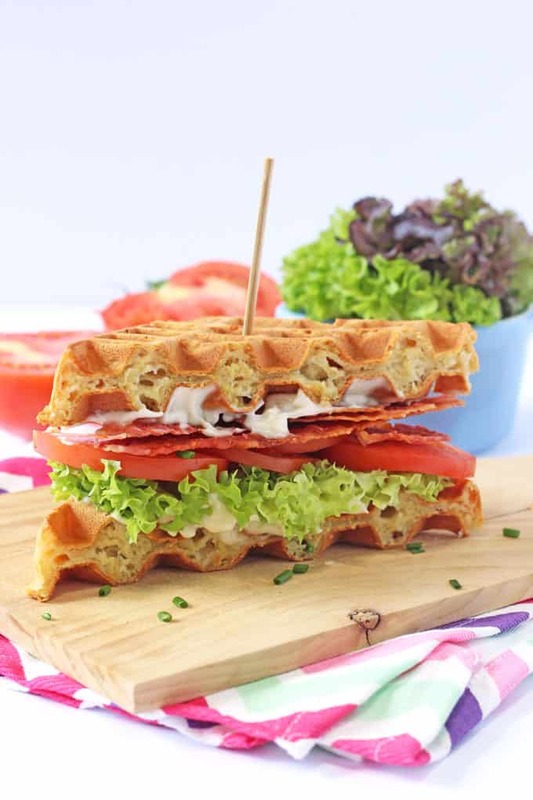 I immediately knew I wanted to try the classic combo that is the BLT in my savoury waffle. Having never made waffle before I decided to adapt an existing recipe and I used this one from Joy The Baker. So how did they turn out? In one word; incredible! The waffle iron is so easy to use. It has 4 pre-set heating times depending on what type of waffle you are cooking and a “custom” setting for anything else. I used the custom setting which was 5 minutes, checked the waffles to see how they were doing and then pressed the “bit more time” button which gives them another 30 seconds of cooking. The waffles were absolutely perfect; soft and spongey on the inside, crispy on the outside. My husband was beside himself with excitement when he saw what was for lunch and the kids also loved the novelty factor. It made such a nice change from using bread to make another standard old BLT sandwich! The Heston Blumenthal Smart Waffle Iron retails at £169.95 so it isn’t a cheap product. But in my opinion the quality and functionality of this appliance is worth the cost. It feels sturdy and strong and is so easy to clean. There’s no need to grease the iron before using and the waffles lifts off with ease when they are cooked. It also has a nifty little moat running all the way around which catches the overspill, leaving no mess. DISCLOSURE: I was sent the Sage by Heston Blumenthal Smart Waffle Iron for free but all thoughts and opinions on the product are my own. 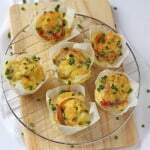 In a bowl mix together the flour, baking powder, baking soda, salt and pepper. In another bowl whisk together the butter, eggs and milk. Add this mixture to the dry ingredients and stir just enough to incorporate all the ingredients. Do not over mix. Add the cheese and chives and mix gently again. 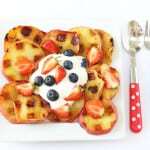 Heat your waffle iron and add approximately 1/2 cup of batter to each of the plates. The amount of batter will depend on the size of your waffle iron. Cook for 4-6 minutes until the waffles are starting to get crispy on the outside. 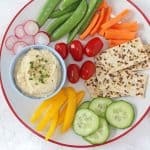 Remove and allow to cool while you prepare the sandwich fillings. 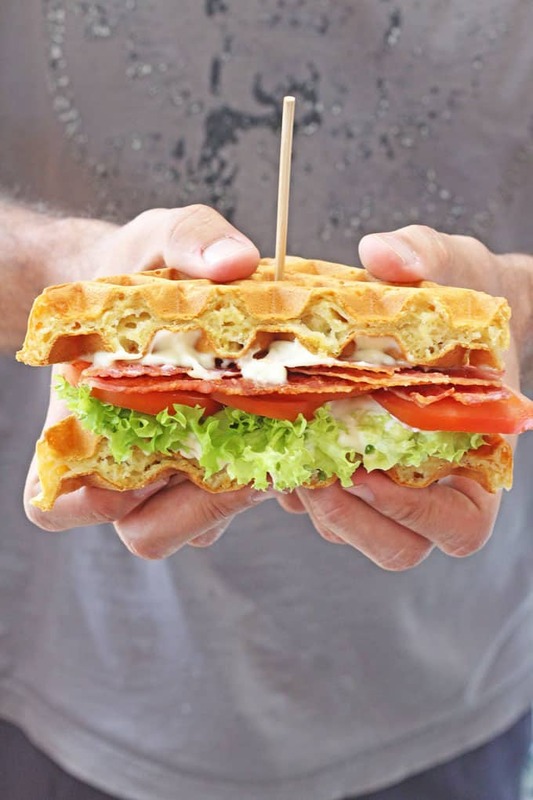 Layer the bacon, lettuce, tomato and mayo between two waffles, cut in half and serve immediately. You are so right! These taste amazing. 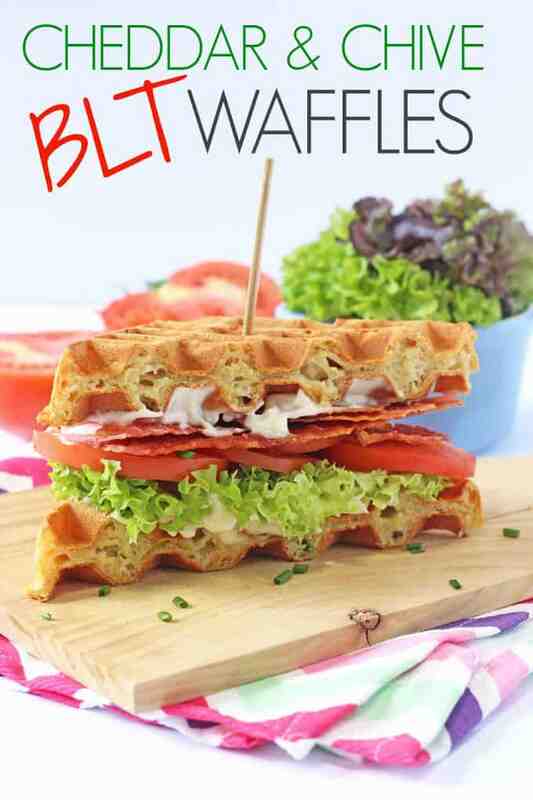 I’d never had a savoury waffle either so was a bit dubious but I’m totally on board with these. 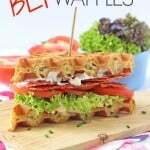 I am thinking of testing out some savoury waffle for my OH in my own Smart waffle maker so will pin this recipe to try out. You HAVE to try it. Its honestly life changing!!!! Thanks Emily, its so delicious, I’m craving another one right now!